Homeowners often times experience cracks in their walls or floors and wonder why they’re there. Cracks in the walls of your home can often be a clue to a settling problem. 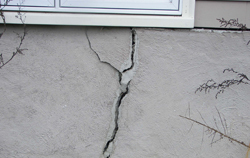 When a home is built on uneven or unstable soil, the walls and floors may crack, creating a need for wall crack repair. 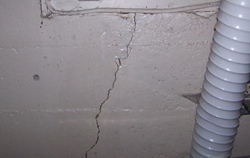 Walls may also crack because of excess moisture around the foundation causing too much pressure. Whatever the cause of wall cracks is, it is important to know that wall cracks usually signify a need for foundation repair. These types of repairs, ranging from underpinning to helical pier installation, should be trusted to the professionals at Tar Heel Foundation Solutions. Outside – Look for cracks in your foundation or bricks that are broken or cracked. Look around your windows for gaps or fascia board that is pulling away. Tilting chimneys are also a sign that you need wall crack repair. Inside – Inside your home, search for cracks in the ceiling, drywall, or floor. You may find that your doors and windows are misaligned or that the trim and molding is beginning to separate. Bowing walls are a sign that cracks may be the least of your problems. Garage – In your garage, look for cracks in the floors, walls, or beam supports between garage doors. Doors and windows separating from the wall are also a key indicator. If you are beginning to notice any of these danger signals, call us today. We can help determine a solution for any foundation problems you may be experiencing. The professionals at Tar Heel Foundation Solutions are educated in identifying foundation wall cracks and the best solutions to repair them. Call today for a free estimate.